When you search for trilobite fossils around the Louisville, Kentucky area there is a high probability that none will be found. On a good day and at the right location one can walk away with some nice fragments. Every so often lightning might strike near by or an entire trilobite fossil will be found. This post is not about that. 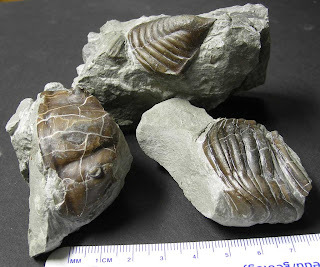 The image presented is of fragments of a Trimerus trilobite that could be cobbled together to create a Franken-Trimerus. It would be a monster. The main pieces are present: head (cephalon), body (thorax), and tail (pygidium). It needs more thorax. 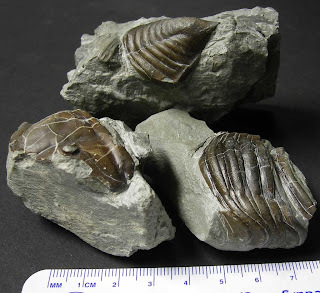 Fossils were found in the Waldron Shale (Silurian) of Clark County, Indiana. Thanks to Kenny for the photos.